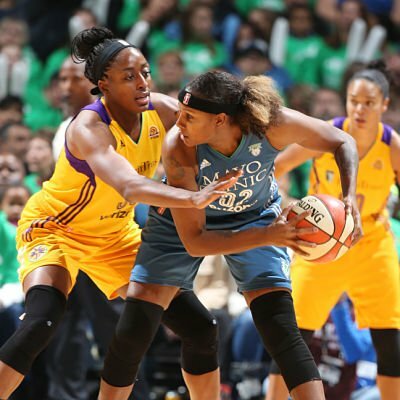 Nneka Ogwumike defends Rebekkah Brunson in WNBA Finals Game 5. Photo by David Sherman/NBAE via Getty Images. The WNBA’s 20th season proved to be an odyssey like no year before it, with extreme highs and lows, controversy, social activism, and a Tale of Two Years in One for several teams. Topped by an unforgettable, riveting Finals series that came down to the last seconds, 2016 is a year for the ages. The league’s abandonment of conference standings for overall standings was a brilliant move, as there was no question that the best teams advanced to the playoffs. And in the end, the top two teams – Minnesota and Los Angeles – vied for the title. It was the match up fans had dreamed of for years, and it more than lived up to hopes and hype, with the last two games going to the wire and Los Angeles pulling it out, 77-76. Both fans and players felt the difference. The new playoff structure was not without its faults, however. Many felt the single-elimination games of the early rounds were too harsh and abrupt, and made for anti-climactic semifinals. Eighth-seeded Phoenix, for example, knocked off the Eastern Conference-leading New York Liberty. They were then swept by Minnesota. The league would do well to revisit the format and the second round, at the least, should be a best-of-three series. 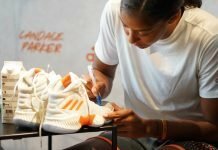 With an early start to training camp on April 24, due to the impending Olympic break, controversy began the next day when USA Basketball announced that two-time league MVP Candace Parker was left off the roster for the Games. This started a firestorm of criticism that never fully ebbed. As the summer began and repeated shootings of unarmed African-Americans by police continued around the U.S., five teams chose to protest by altering their warm ups. Three of those teams – the Indiana Fever, New York Liberty and Phoenix Mercury – were fined. The league rescinded the fines ten days later after heavy criticism. Statistically, Los Angeles forward Nneka Ogwumike was the clear Most Valuable Player this season, as she lead the league the entire year in field goal percentage. She also broke a WNBA record in June when she went 12 for 12 from the floor. But as a non-marquee face for the Sparks franchise, she was an unorthodox selection for the award. Win it she did, however, capturing 31 of 39 votes. Similarly, Los Angeles was picked last spring to finish eighth overall, but they spent the year at the top of the standings, and tied the league record for best start to a season at 20-1. They saw a slump at midseason, and three-time champion Minnesota was the heavy favorite to win the title once again. When the final horn sounded, no one seemed more surprised than the Sparks themselves. “When the final buzzer sounded I was like, ‘What? We won? '” Parker told ESPN SportsCenter. League play stopped the second week in July for the Olympics and didn’t resume until the final weekend of August. Some teams, like the Seattle Storm, gave players close to a month off between practices, and for all, it almost seemed like two separate seasons. Two teams that benefited from the break were the youthful Storm and Connecticut Sun. Seattle made a playoff push to make up for their slow season start, and made the cut. Connecticut came very close, lead by Chiney Ogwumike, who proved with her strong performances that she is recovered from the leg microfractures that kept her out in 2015. The Phoenix Mercury also looked better after the break than before, when they began the season 0-4 after being picked to win the Championship before the season. This year saw greats Tamika Catchings, Lauren Jackson, Swin Cash, Penny Taylor and DeLisha Milton-Jones retire, as well as Jayne Appel-Marinelli and Lindsay Harding. At the same time, the infusion of one of the best draft classes in WNBA history, as well as exciting newer players, show the promise of the future. Rookie of the year Breanna Stewart, Tiffany Mitchell, Aerial Powers, Moriah Jefferson and Imani Boyette headline the class. The Ogwumikes have stepped into leadership roles not only on court, but with the WNBA player’s union. Chelsea Gray, Elizabeth Williams, Jewell Loyd, Emma Meesseman, Kayla McBride and Natasha Howard are other players who recently entered the league and have already begun to help carry their teams. The next 20 years will be awe-inspiring. Then-MVP Elena Delle Donne announced her engagement to Amanda Clifton just before Team USA departed for the Olympics. A few months earlier, Mystics forward Stefanie Dolson came out in an ESPN story. The Liberty’s Shavonte Zellous came out in the course of discussing how her sister almost went to LGBT nightclub Pulse in Orlando the night of a massacre. All three disclosures were non-events, and no disparaging remarks were made public. The WNBA has never been known for outstanding officiating, but two gaffes in the playoffs were especially cringe-worthy. After Finals Game 4, league officials admitted the next day that referees missed a back court violation call on the Lynx in the game’s final minute, which would have given the ball to Los Angeles. The day after the Championship game, the WNBA announced that an Ogwumike shot with 1:14 left was launched too late. Fans and media nationwide called for new officials. Others have pointed out that it takes time and money to train new referees, and many aren’t inclined to work summer months. So WNBA fans may have to continue chewing their hands and biting their lips for a while longer. The WNBA saw attendance improve this season, and TV ratings for the Finals were up dramatically. General interest also increased, and more sports fans across the country seemed aware of the season and what was going on in the playoffs. All the buzz is a sign that the league is growing. Both the Sparks and Lynx will be back next year, hungrier and stronger than ever. Los Angeles, which used seven players for most of playoffs, has room to grow and can be even more dangerous if they get a bench. Minnesota is especially good when they have a loss or two to avenge, and they will be hungry to get back after the painful Finals loss. The New York Liberty and Chicago Sky will both be back strong, if they stay healthy. The Dream could also surprise, if they can continue the momentum they found at the end of the season. 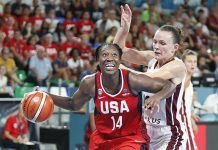 The Sun hold the most potential for improvement now that Chiney Ogwumike is back to her high-scoring ways. Rookies Rachel Banham and Morgan Tuck will also be back from injury, and Connecticut will get to add Jillian Alleyne to the line up. The Storm’s youth brigade, lead by Stewart and Loyd, promise to keep thrilling fans as well. Question marks are the Indiana Fever, which will have to find life after the retirement of Catchings; the San Antonio Stars, who have a dynamic new general manager in Ruth Riley, but still need a coach; and the Dallas Wings, who seem plagued with injury each year. Other unknowns are the Mystics, who have seemed to flounder the last few years, and the Mercury, whose volatility this season was remarkable. The WNBA and its fans counted on the league’s 20th season being memorable – they just didn’t realize how momentous it would end up being. Indeed, this year felt like an odyssey and given how long and eventful it was, I still can’t believe it’s over! Wonderful summary! !